GALWAY ANIMATORS, Aoibhinn Ní Choille and Cian MacCoille, have won the Animation Award at the recent Fresh Film Festival in Limerick. 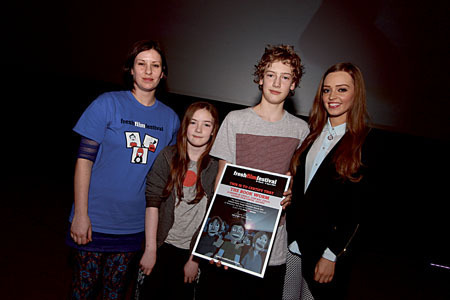 The Salthill based brother and sister were presented with the Ireland's Junior Young Filmmaker Award 2014 for animation at the festival last weekend, marking the second year in a row in which they have scooped the prize. Aoibhinn and Cian have both attended animation camps at the Galway Film Centre. Pictured above (LtoR ) are: Miriam Garcia Mortell (Fresh Film Festival ); Aoibhinn Ní Choille; Cian MacCoille; and Diana Bunici from Elev8.